PMS…the crankiness, the bloating, the clumsiness, the…other symptoms. Who needs it? For years I suffered the ill effects of PMS, only to discover that there actually is an answer to PMS: evening primrose oil. Of course, taking evening primrose oil doesn’t mean you shouldn’t eat healthy, get plenty of rest, and exercise as additional means to alleviating PMS symptoms, but evening primrose oil seems to take the sting out of the monthly annoyance. The evening primrose is a flower. Many of the species have blossoms that open in the evening, which may open in under a minute. Most of the flowers are yellow, but some have white, purple, pink, or red. Native Americans and early settlers used primrose as a food source. 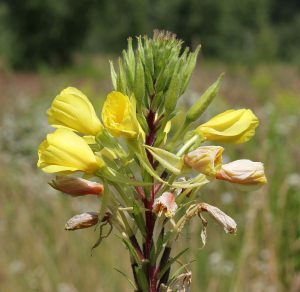 But the oil of evening primrose comes from cold pressing the seeds of the evening primrose plant. Evening primrose oil has a variety of uses, ranging from assisting with minimizing bone loss to reducing nerve damage from diabetes. Like many “alternative” supplements, the research is spotty and the supplements not tested with scientific rigor. Additionally, research testing the effectiveness of evening primrose oil as a treatment for PMS has used a single supplement, rather than testing a variety of brands. As such, it’s difficult to say with certainty that evening primrose oil is effective for alleviating PMS symptoms. I can only offer my own anecdotal experience. Note that I am not a medical professional. Before taking any supplement, please consult with your doctor to ensure that you do not experience any adverse effects or medication interactions. I started using evening primrose oil in my early 30s. It was recommended to me by an OB/GYN who thought it might help me with PMS symptoms. I took it for years, and I thought that it was helpful. When I turned 40, though, I felt like maybe it wasn’t working anymore. So I stopped taking it for awhile. A few months ago, I noticed I was getting more irritable with PMS, and it seemed I was experiencing PMS symptoms with increasing frequency and intensity. So I decided to try taking evening primrose oil again. It didn’t take long to see results. Is it possible that I somehow developed a tolerance to or a buildup of evening primrose oil in my system? Maybe. I’m not sure. Should You Take Evening Primrose Oil? If you have PMS, evening primrose oil could be helpful to you. However, please check with your doctor before taking any supplement. It’s important to know if a supplement might interact with one of your medications or have unexpected side effects.